If you’re ever in San Francisco you MUST go and eat your way through the Ferry Building. This is my guide to doing just that! I am absolutely obsessed with San Francisco. I grew up not far from there but didn’t appreciate it much until I left back in 2002. Now I say that I live outside Sacramento but my heart is still in that foggy city by the bay. Some day I will live there again, but for now I have to placate myself with lots of day and weekend trips. I’ve decided that I want to share these ideas with you so you can love my city too. 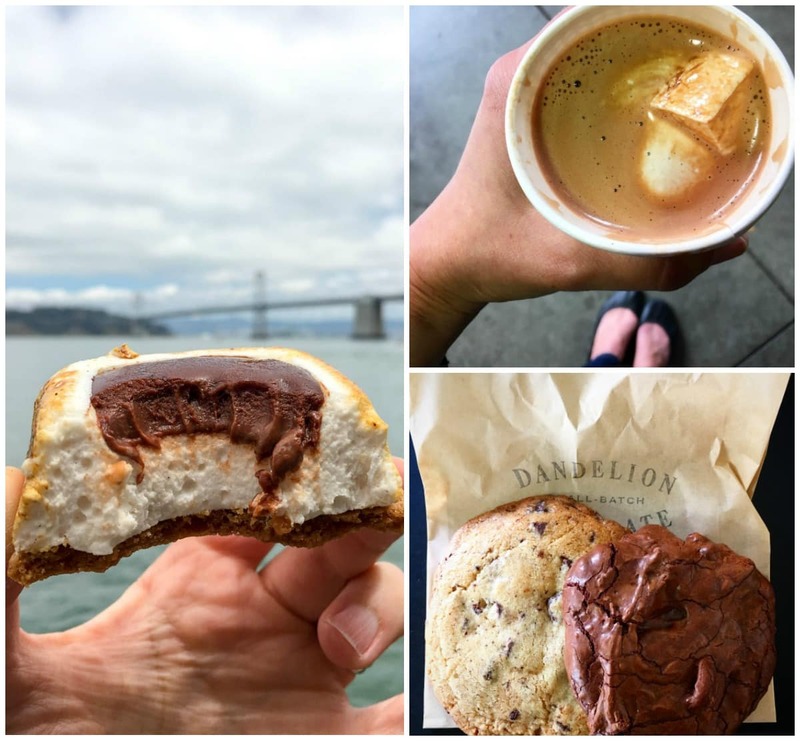 If you’re planning a trip to San Francisco, or maybe you live nearby and haven’t played tourist in awhile, my Crazy for San Francisco series is for you. First up I’m detailing what I love to eat in the Ferry Building. First, a little bit of history. 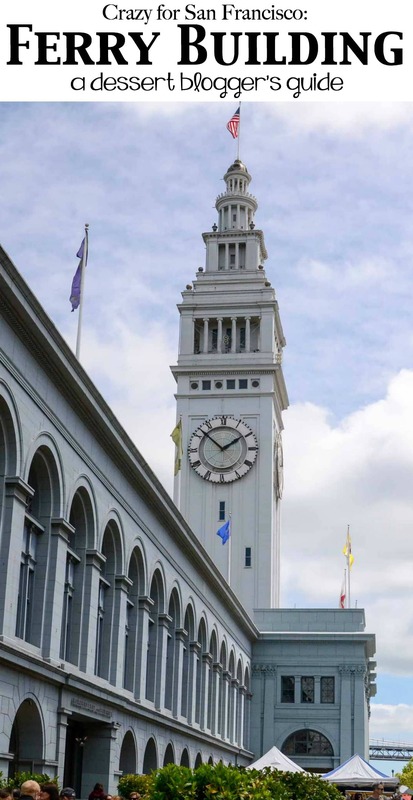 The Ferry Building is located on the Embarcadero at the foot of Market Street. It’s a central hub of all things quintessentially San Francisco. 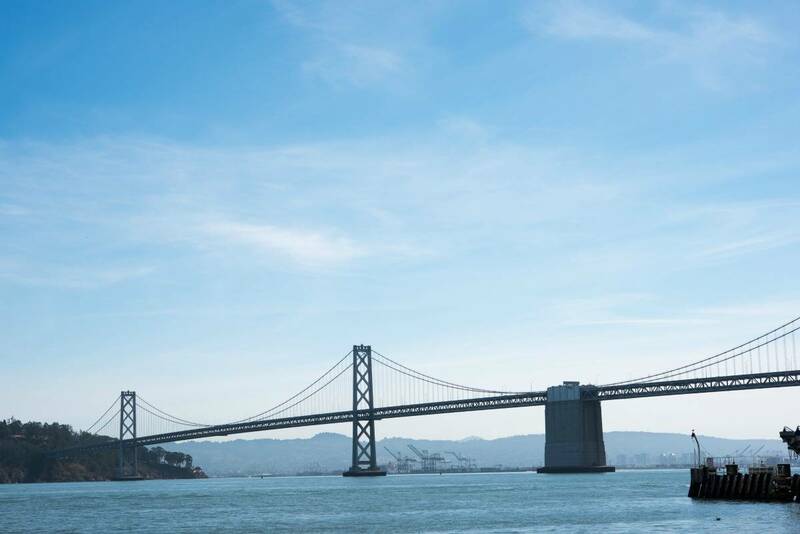 The Embarcadero is a long stretch of road that runs along the bay and is dotted with restaurants, ferry docks, Pier 39, AT&T Park, and the Exploratorium. The Ferry Building is, literally, at the center of it all. 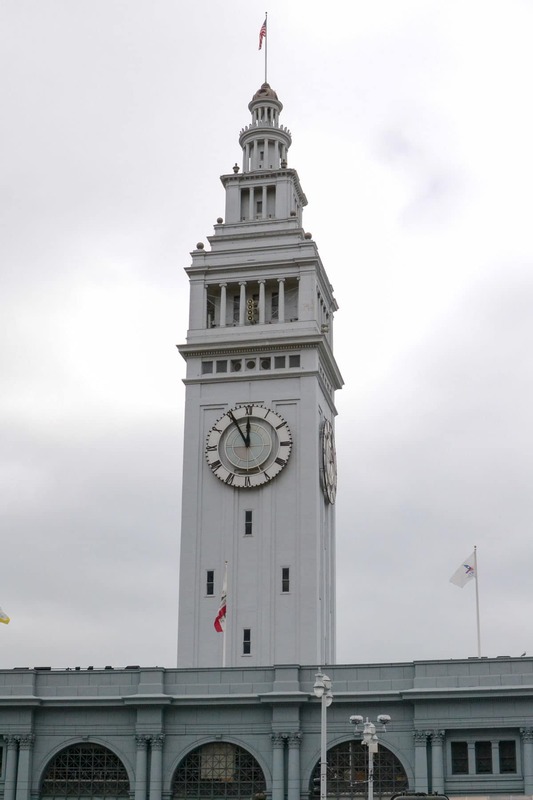 The Ferry Building was originally built back in the 1800s as a ferry hub for all the visitors coming to San Francisco. Before the bridges you could only reach the city by boat (unless you were coming from the Peninsula). Once the Bay Bridge and Golden Gate were completed, there was no need for boats and the area fell into decline. It was then that a double-decker freeway was built, running up and down the street, dividing the waterfront and Ferry Building from downtown San Francisco. When I was young, the Embarcadero was kind of a gross area. The freeway, and all that came with it, made the area undesirable. Then, in 1989, the Loma Pieta Earthquake happened and changed the face of the Ferry Building forever. The freeway collapsed during the quake and was removed. Years later, AT&T Park was built and the area started to revitalize itself. Now, the Ferry Building once again stands in all it’s magnificent glory, gorgeous to they eye AND the stomach. Why? Because it’s FULL OF FOOD. That’s right, my friends. The entire building is full of restaurants, food stores, and pop-up food stands. On weekends, they have a farmers market in front that reaches across the street and up Market, selling everything from fresh and local produce to photography and knitted beanie hats. One of my favorite things to do is to stand in front of the building, close my eyes, and breathe in the smell of my yoga pants getting tight in the waist. There are countless numbers of food options in the Ferry Building. It would be impossible for me to list them all (or even eat at them all). I’m going to give you MY tour of the marketplace. This is what we do every time we visit, adding a doughnut here or a cookie there, depending on what pop-up stands are in place that day. Dandelion Chocolate is located outside the main building, next to one of the main doors. It’s a MUST stop. Honestly, if I were you, I’d stop on the way in…and on the way out. 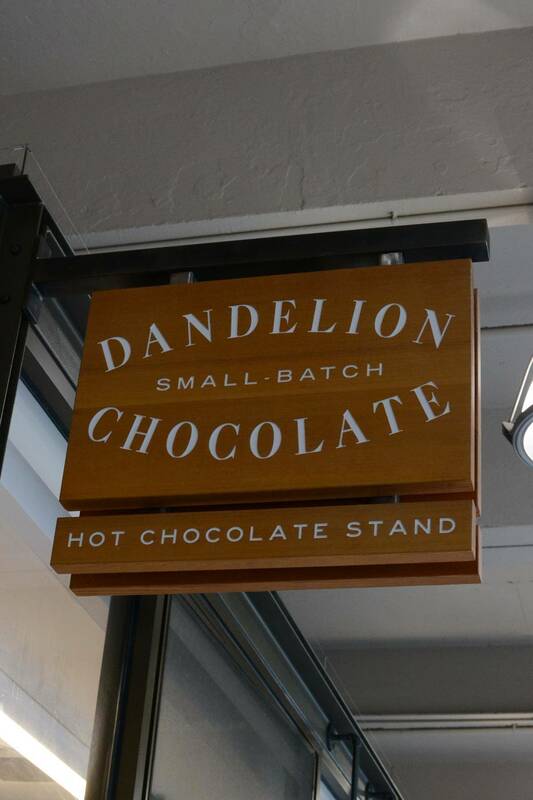 Dandelion Chocolate is based in the Mission District, and the one at the Ferry Building is a pop-up of sorts. They sell their amazing hot chocolate and mochas as well as some baked goods. The baked goods change often so if something looks good, try it, because the next time you go it might not be there. You can also purchase chocolate from all over the world, and they have tasting bowls set up. It kind of blew my mind the first time how different chocolate tastes from different parts of the world. Be sure to, at minimum, get the House Hot Chocolate or House Mocha. It’s unbelievable (as it should be, it’s $5/cup). If you’re adventurous, get the Mission Hot Chocolate, the semi-spicy version of their original. It’s SO good. Pictured above: the S’mores Bar, signature Chocolate Chip Cookie, and a double Chocolate Cookie that is TO DIE FOR. Out of all three, the later is the BEST cookie I’ve ever eaten. Buy 4, then send me one. Once I get into the Ferry Building, I’m overwhelmed with the smells and sounds (and amount of people). I suggest you go early, before it becomes a total zoo. 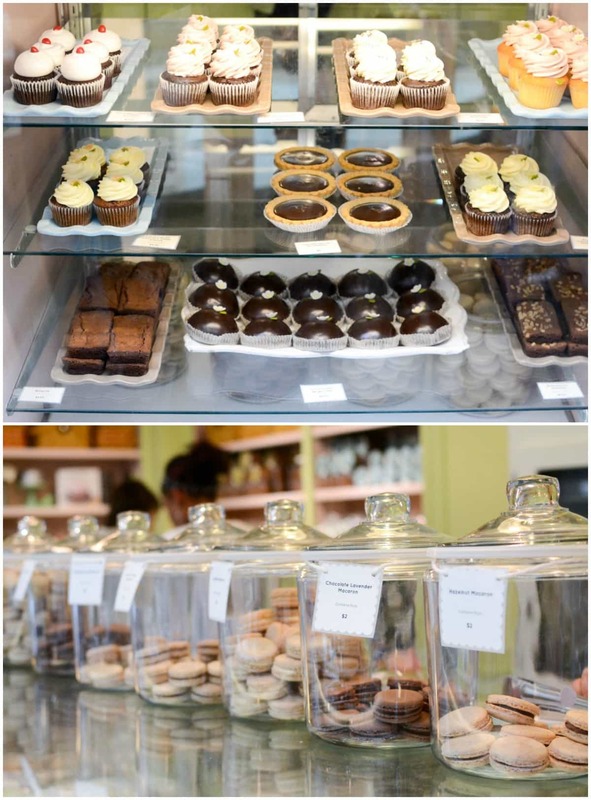 The first place I like to hit after my hot chocolate sugar rush is Miette. 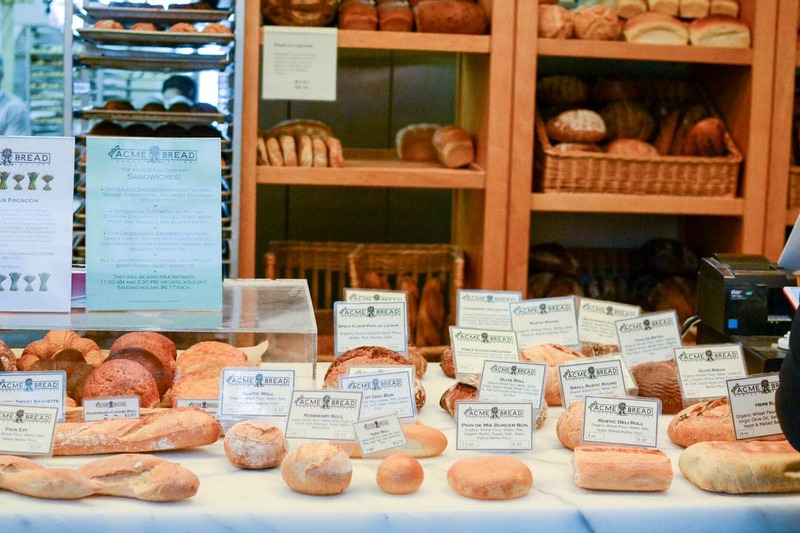 You may have heard of Miette because of their cookbook, but they’re one of the more famous San Francisco bakeries. They have an entire case FULL of gorgeous baked goods, plus packaged shortbread and other candies and cookies, but the stars of the show are their Macarons. Really, I never buy anything at Miette besides the macarons. I usually spend about $25 on them, they’re that good. They’re Jordan’s favorite, and they’ve spoiled her. Whenever we get macarons anywhere else she turns her nose up at them. While everything at Miette looks amazing (and I’m sure it is), their macarons are not to be missed. My favorites are the Hazelnut, Dulce de Leche, Vanilla, and Pistachio. We have a basic pattern when we go to the Ferry Building. There are so many restaurants and eateries, it gets overwhelming. Our favorite thing to do is gather all the ingredients for a picnic lunch which we then enjoy behind the building overlooking the water. Once we’ve got our dessert, we’re ready to stock our picnic basket with all the staples: bread, cheese, and meat. Next door to Acme Bread is The Cowgirl Creamery, where they sell every kind of cheese imaginable. They let you test drive it too, so you can make sure you’re in love with a gouda or swiss or cheddar before you buy. They were doing some construction and just had a small selection last time we visited, so I didn’t take photos. We always get a nice nutty white cheddar when we stop in, but take your time, do some tasting. You’ll find a flavor you love, I promise. Boccalone (Tasty Salted Pig Parts). I’m sure you’ve heard of Boccalone, if you’ve ever watched the Food Network or seen any of those travel food shows. Boccalone is the home of salumi, which is confusing because it’s basically salami. I think using the “u” makes it more acceptable to spend $11 a log? Or something? It’s worth every penny, I promise. 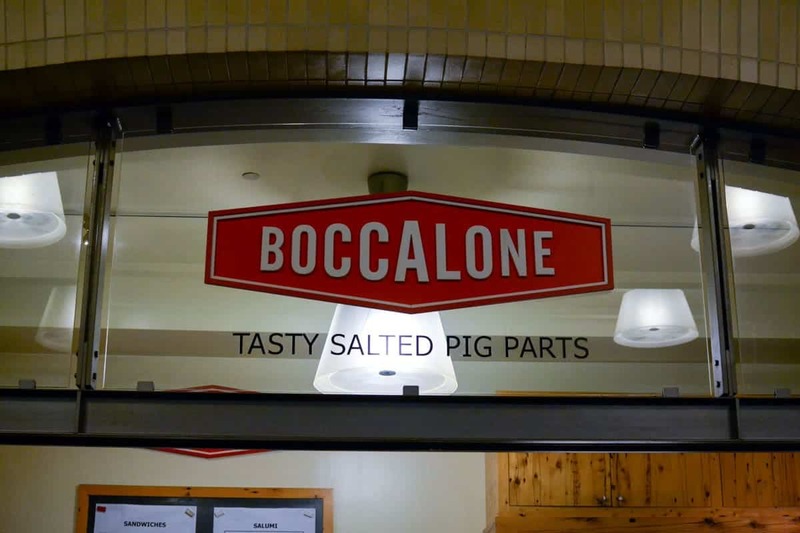 At Boccalone you can buy all sorts of tasty salted pig parts packaged and ready to go. They also sell sandwiches and, one of my favorites: the Salumi Cone: a cone of whatever tasty parts you want. 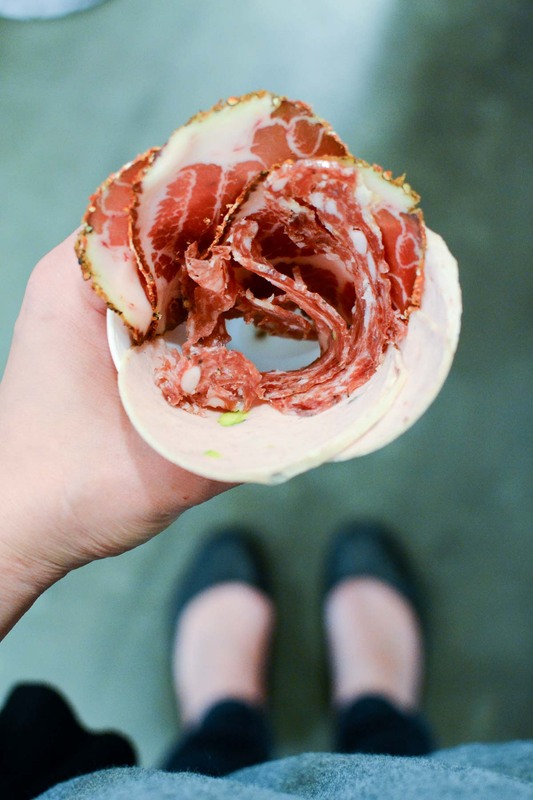 Pick up a sandwich or a salumi cone (choose your favorite meats). 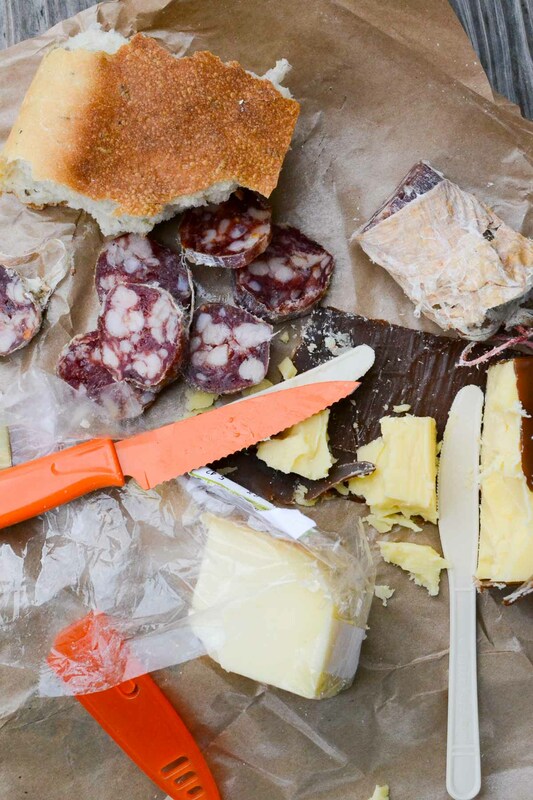 My favorite thing is to buy a Salami Pepato “chub” and slice it to go with my bread and cheese at our picnic. 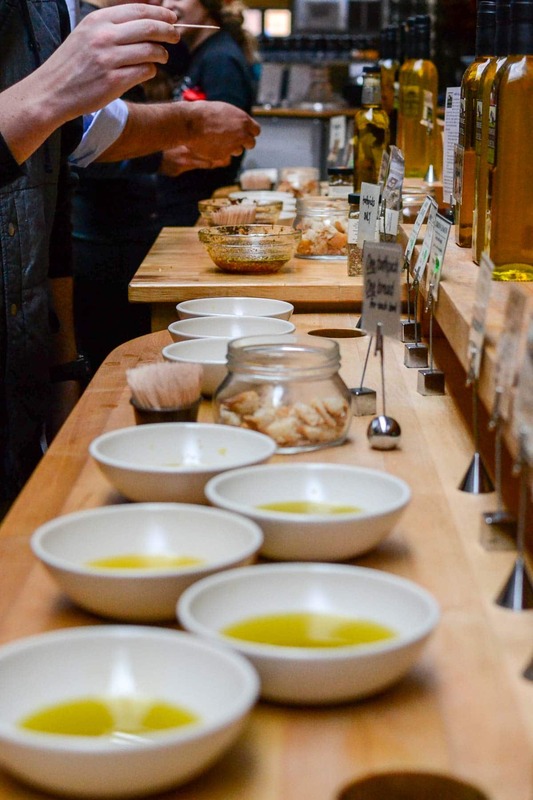 Those of you not living in urban areas might think that an entire store devoted to Olive Oil is crazy, but it’s a thing. 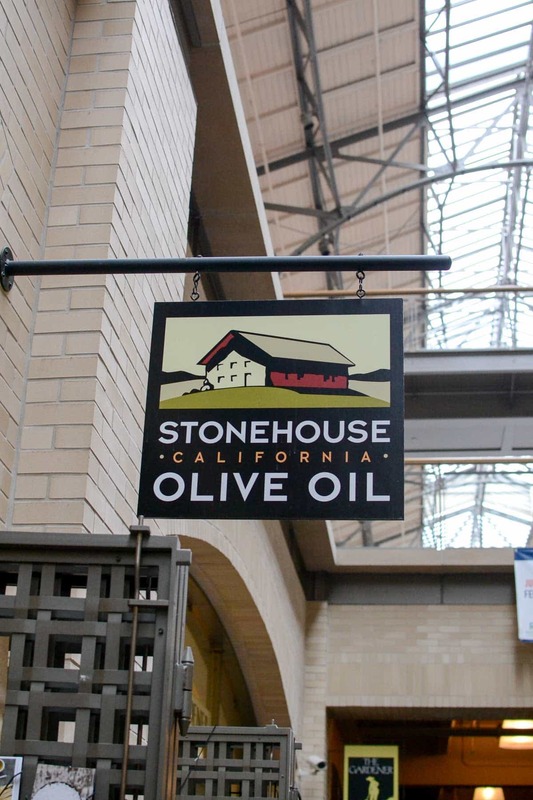 Olive oil tasting is as big as wine or coffee these days, and we always stop at Stonehouse for tasting. The have so many to choose from, flavors like rosemary or basil or lemon or chile. 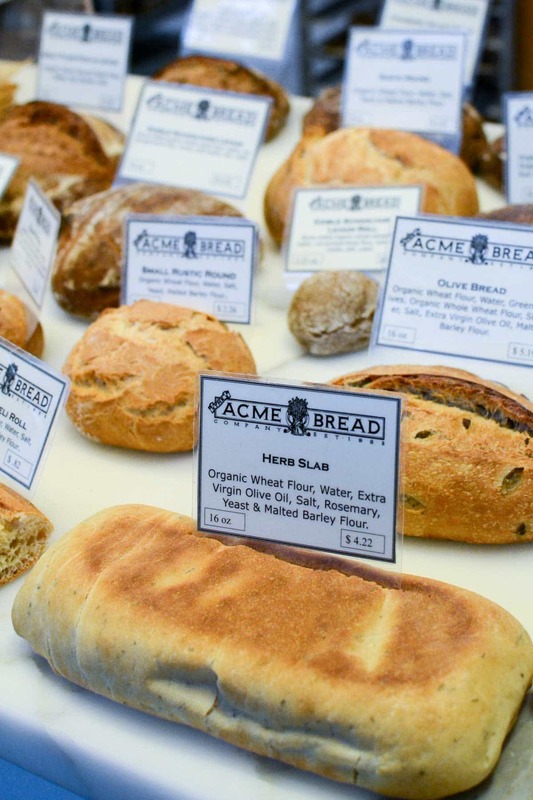 Grab a bottle to go with your bread! The basil oil is hands down my favorite. Worth every penny! 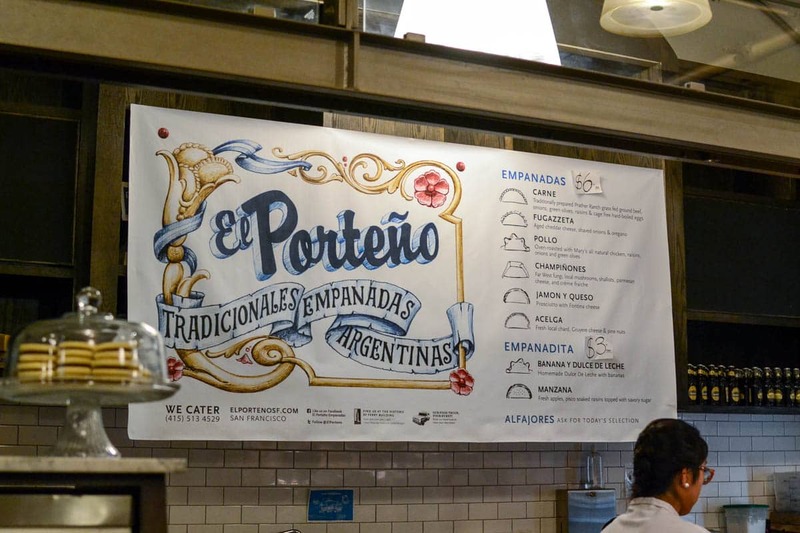 Every time we walk through the building I drool as I walk by El Porteno, the empanada shop. I’ve never bought one…but I think next time I have to. 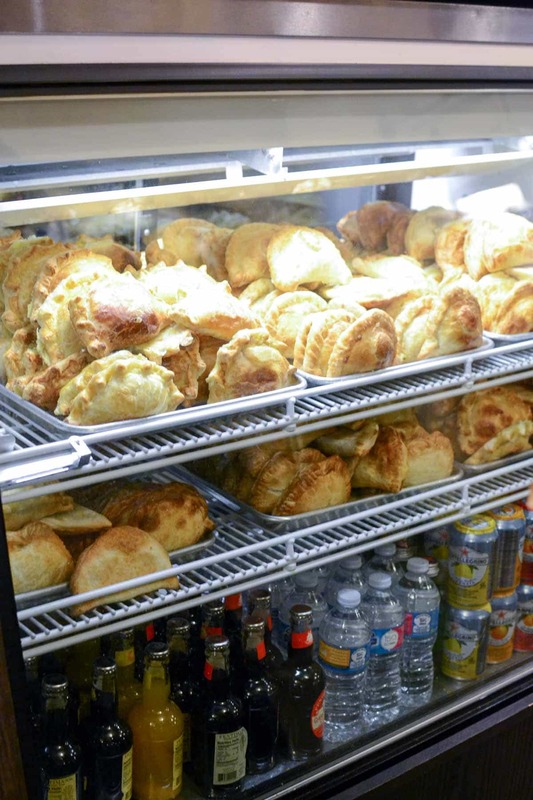 Heck, empanadas goes with salami, cheese, bread, and macarons, right? Like I said, these eateries are only a small fraction of what you can eat in the Ferry Building. There is a mushroom shop, a Farm Fresh To You Fruit Stand, wine tasting. A meat curator, fruits and nuts, Mexican. And that’s not even including the sit down restaurants like Gott’s (such amazing burgers) or the Hog Island Oyster Company. We never make it far enough for a restaurant. We take our picnic to the back deck of the Ferry Building, sit on a bench, and watch the world go by. And THAT, my friends, is my happy place. And my hungry place! Have you been to San Francisco? What are your favorite parts? Ok, so now I’m hungry and desiring a trip to SF. Thanks for the information. I get to the Bay Area 2 to 3 times a year and will have to make this one of my stops. 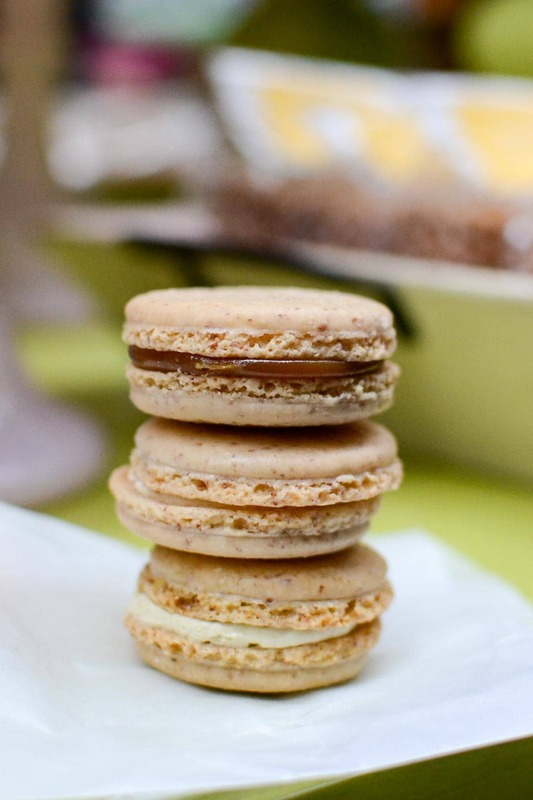 Macarons are to die for, wish I had the patience to make them. If I did that is all I would eat and probably weight 300 lbs. 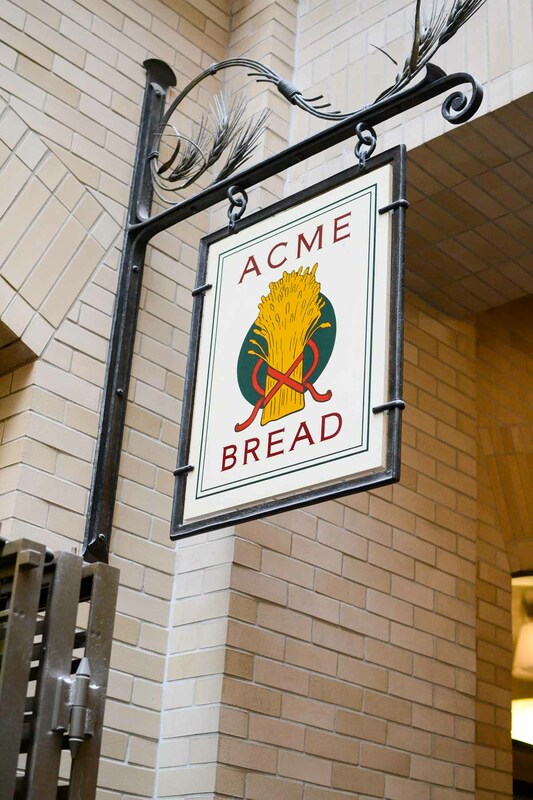 As a Ferry Building fan and a huge lover of the San Fran food scene, LOVE this post. That s’mores bar looks insane. Next time I’m in town, I’m heading over to see if they made any! Hope you had the best visit, and that you’re partying it up in Hawaii! Love this post. Saved it to my travel board. Visiting a new city or even just not your own city can be over whelming. I like how you broke it down to just the ferry building. That salumi cone… wow I need it in my life! I’m looking at this post again..we went to Sausalito last year for the first time. We live in Iowa, I’m from Ohio. 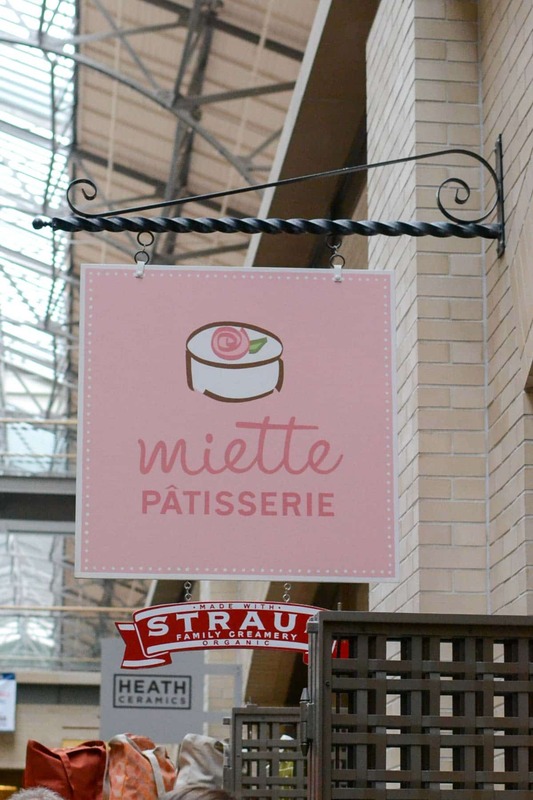 Anyway..went to sf mainly for Miette, as I have their cookbook. However..look at your picture of Miette in your post — in the background is Heath Pottery which happens to be my hubby’s grandmother’s first cousin (Edith Heath from Battle Creek, Iowa) who started it all. The plant is in Sausalito. Beautiful pottery. Wow, I had no idea it was a local company! Thanks for the info!